Electrical energy, after being produced at generating stations (TPS, HPS, NPS, etc.) is transmitted to the consumers for utilization. This is due to the fact that generating stations are usually situated away from the load centers. The network that transmits and delivers power from the producers to the consumers is called the transmission system. This energy can be transmitted in AC or DC form. Traditionally, AC has been used for years now, but HVDC (High Voltage DC) is rapidly gaining popularity. Electrical power is normally generated at 11kV in a power station. While in some cases, power may be generated at 33 kV. This generating voltage is then stepped up to 132kV, 220kV, 400kV or 765kV etc. Stepping up the voltage level depends upon the distance at which power is to be transmitted. Longer the distance, higher will be the voltage level. Stepping up of voltage is to reduce the I2R losses in transmitting the power (when voltage is stepped up, the current reduces by a relative amount so that the power remains constant, and hence I2R loss also reduces). This stage is called as primary transmission. 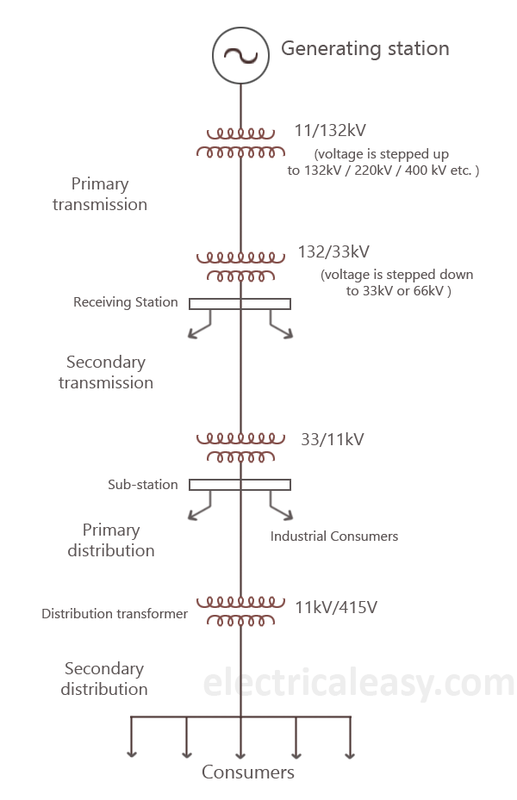 The voltage is the stepped down at a receiving station to 33kV or 66kV. Secondary transmission lines emerge from this receiving station to connect substations located near load centers (cities etc.). The voltage is stepped down again to 11kV at a substation. Large industrial consumers can be supplied at 11kV directly from these substations. Also, feeders emerge from these substations. This stage is called as primary distribution. Feeders are either overhead lines or underground cables which carry power close to the load points (end consumers) up to a couple of kilometers. Finally, the voltage is stepped down to 415 volts by a pole-mounted distribution transformer and delivered to the distributors. End consumers are supplied through a service mains line from distributors. The secondary distribution system consists of feeders, distributors and service mains. Electric power transmission can also be carried out using underground cables. But, construction of an underground transmission line generally costs 4 to 10 times than an equivalent distance overhead line. However, it is to be noted that, the cost of constructing underground transmission lines highly depends upon the local environment. Also, the cost of conductor material required is one of the most considerable charges in a transmission system. Since conductor cost is a major part of the total cost, it has to be taken into consideration while designing. The choice of transmission system is made by keeping in mind various factors such as reliability, efficiency and economy. Usually, overhead transmission system is used. Due to the economic considerations, three-phase three-wire overhead system is widely used for electric power transmission. Following are the main elements of a typical power system. Conductors: three for a single circuit line and six for a double circuit line. Conductors must be of proper size (i.e. cross-sectional area). This depends upon its current capacity. Usually, ACSR (Aluminium-core Steel-reinforced) conductors are used. Transformers: Step-up transformers are used for stepping up the voltage level and step-down transformers are used for stepping it down. Transformers permit power to be transmitted at higher efficiency. Line insulators: to mechanically support the line conductors while electrically isolating them from the support towers. Support towers: to support the line conductors suspending in the air overhead. Protective devices: to protect the transmission system and to ensure reliable operation. These include ground wires, lightening arrestors, circuit breakers, relays etc. Voltage regulators: to keep the voltage within permissible limits at the receiving end.